In the early 1980’s, I attended a Bible seminar called Basic Youth Conflicts put on by a Bible teacher named Bill Gothard. Gothard was a Youth Pastor in the Chicago area for a number of years until he went into this traveling ministry of putting on these seminars. There were many good and useful things that he taught: the importance of the Word of God and memorizing it, the value of accepting how God has made you, etc. On the other hand, some of the things he had to say were just a little whacky – like that everyone should memorize out of the King James Version because the poetry of it was better for your mind. Anyway, because of his emphasis on the importance of the Word of God in the life of the believer, one of the things that Gothard encouraged his attendees to do was make a vow to read it 5 minutes every day for the rest of your life. So with Bill Gothard’s encouragement, I made a vow. Now I wouldn’t encourage anyone today to make such a vow, as this article will hopefully demonstrate, although I would definitely encourage everyone to read the Bible every day for at least five minutes. But that’s another blog. Well, some years later, I thought I would expand on Gothard’s idea to bring life change to other areas of my life. So I set up a system of vows. I didn’t talk about it a lot, and I don’t think very many other people knew about it outside of Diane. There were a few different areas where I made vows, but you can guess the usual suspects – eating right, exercise, etc. I promise I won’t eat desserts after 6 PM. I promise to work out 3 times a week for a half an hour, etc. I would make a vow for a week and then renew the vow at the beginning of the next week. And at first, it was great; at one point, I even thought I might write a book about this new vow plan I had developed, but it was not to be, because I eventually gave the system up. You see, while there were small gains, it was not producing the life change that I wanted it to produce, and it was probably having some unintended negative effects. You see, the problem with what I had done is that I was simply creating a number of new laws, and my biggest problem was simple: I didn’t understand the power of the gospel, and I didn’t understand the purpose of the law. 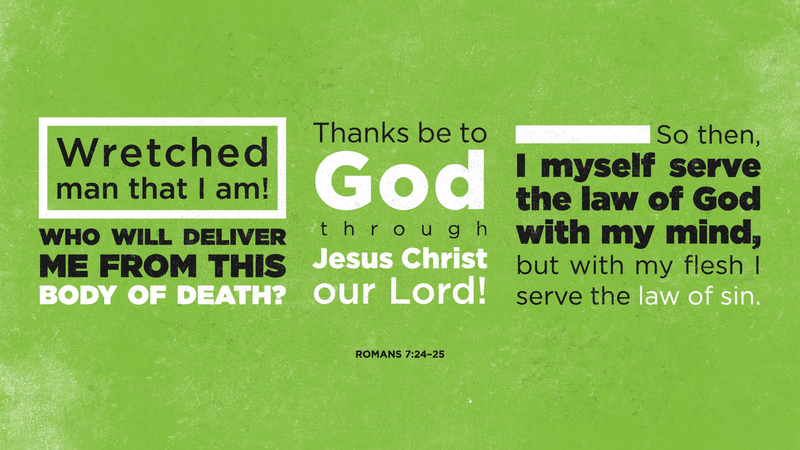 Paul is saying that if we want to be fruitful for God, then we need to be set free from the Law of Moses. Because in the end, it’s not the Law of God that transforms us, but the Love of God. We will not be changed by rules, but we will be changed by grace. In fact, this is the larger point of Romans 7: Rules will not make you holy, because the flesh cannot observe God’s commandments – only the Spirit can help us do that, and He comes to us through the glorious gospel of God. So I’m thankful for the good things I learned from Bill Gothard, and yet, as much as I love to tell people to read their Bibles, I would never encourage anyone to make a vow to do so. Laws don’t make holy people. The Spirit of God Who comes to us through believing in the Gospel – He is the key to holiness.